Roger’s poem, “Stepping Stones”, — at least the first two pages — on the press….or I should say the remnants of the first two pages and the beginning of their reconstruction. This little project began a couple of years ago, almost, and it is only just going to print. I don’t know if there is any good reason for the delay beyond my usual procrastination, other things getting in the way, and the feeling I have had that I didn’t have it figured out yet — not the poem, but rather the best way to publish it. 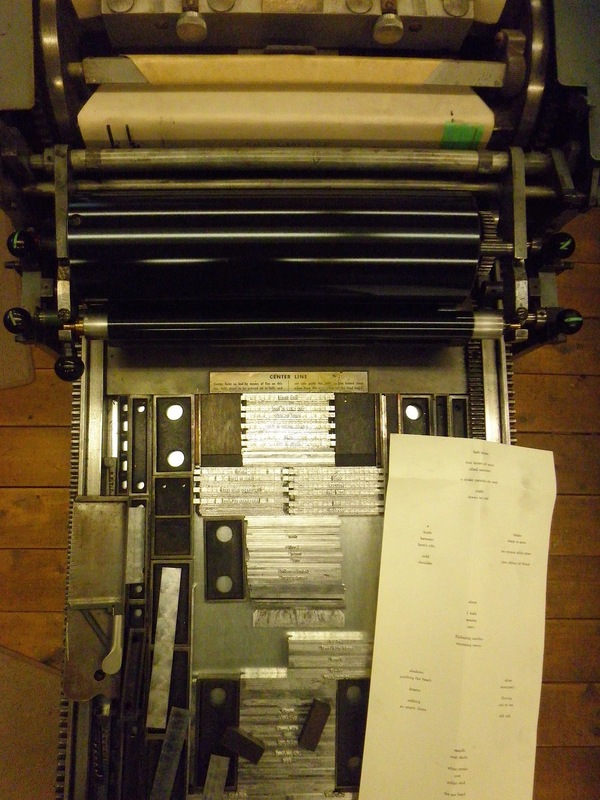 However, all that being said, last year I did cast all eleven pages of the poem itself on the Ludlow in 12 pt Number Eleven Light and Light Italic. I have had it all leaded and in galley trays just waiting for……..well, for today, I guess. I locked the first two pages in the press and inked it up and did a proof and…….I was not happy at all! Not discouraged, but not happy with the proof. Granted, it’s not on the paper it will be printed on (which I thought I had in hand but changed my mind on and which should be here before the end of the week), but it is just not popping out enough. It hasn’t got that crisp look about it. It’s just not good enough for what I am hoping is going to be a really good little book when it’s finished. So, although I had not planned to use it for this, I decided just like that to hand set the poem in my shiny new 14 pt Bembo and Bembo Italic. The first three stanzas are in the picture – not a very good picture – with some of the Ludlow casting still there. I think I’m going to be happy with it although I’m having to resize the finished book to give the poetry more breathing space on the page. Good thing, I guess, that I didn’t have the paper here and cut before now. That would place me well up Crap Creek without a paddle. Now the challenge at hand is to get back to it in the next couple of days and see if I can set the rest of these two pages and pull a proof. It’s taking me a bit to get up to any speed with the hand setting, but it’s coming. The next big thing will be to run it by Roger…..he hasn’t seen it yet. Nor has he seen my changed idea for paper……I may still be up Crap Creek without a paddle. We’ll see what we will see, I guess…….and as for this project and the way it is ‘progressing’……….it will happen when it’s meant to happen……as perhaps does everything……….